Whether referring to a person with an intellectual or developmental disability or simply a person who makes a blunder, the r-word word has unfortunately become part of America’s colloquial language. While the r-word used to refer to a person with an intellectual disability in the medical and scientific communities, everyday usage charged the term with hatred and denigration over time. As an intern at Special Olympics Wisconsin this past summer, I had the honor of meeting and working with several individuals with a wide range of intellectual and developmental disabilities. The people I met had such energy, enthusiasm, drive, spirit, and courage as well as some of the best senses of humor I have ever encountered. Although I already recognized the seriously harmful effects of using the r-word on people with disabilities’ confidence, self-esteem, dignity, and sense of self-worth, interacting one-on-one during the Summer Games, the World’ Largest Truck Convoy, and local Madison events made me realize just how incredibly talented and ordinary people with intellectual disabilities are. When I say “ordinary,” I mean I had conversations and laughs with the athletes and fans just the same as I would anyone else. We talked about food, the upcoming games, sang and danced to songs, cheered for people in the parades, and honored the law enforcement and military veterans who participated in the ceremonies. This all got me thinking, how in the world can such a demeaning word that in no way captures the diversity, uniqueness, spirit, and potential of each individual I met still be used in everyday conversations? The r-word robs these incredible individuals of what people without intellectual or developmental disabilities take for granted—the privilege of feeling a sense of pride, dignity, and confidence in our ability to succeed day in and day out. During the Summer Games, one of the athletes gave a moving speech that will burn in my memory for as long as I live. He talked about his experiences at school as a child being streamlined into “special” classes for people with intellectual and developmental disabilities. Separated from the rest of his peers, he and his other classmates relegated to these special education classes were seen as different and, as is typical in our society to do, marked as “outside the norm” through calling him and his classmates the r-word. Countless times he remembers overhearing his peers from elementary school through high school and beyond assigning this derogatory label to him, and he confessed that the label and their discriminatory treatment wore on him over time. Like anyone laboring under negative stereotypes, stigmas, and labels, he questioned his inherent worth and ability to succeed and fit in with the rest of society. Yet, today he has overcome the sense of inferiority he had internalized as a young adult and works actively not just as an athlete, but also as an activist and public speaker for Special Olympics Wisconsin. His story is important for us to think about on this Day of Awareness because it reminds us of just how detrimental one six-letter word can be to an individual. He is also inspiring, though, because he was able to overcome years of taunting and discrimination and truly live up to his full potential. Every human being, regardless of race, ethnicity, gender, religion, sexual orientation, ability, or class, has the right to realize their full potential and make a difference in our imperfect society. This Tuesday, March 6, I hope that thousands (perhaps more?) 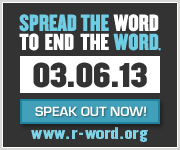 of students across the U.S. add their names and make the pledge to end the r-word. With these seemingly small steps, we as a collective can ensure future generations of individuals with intellectual and developmental disabilities live in a world that values and appraises their talents, skills, and worth as members of a common humanity. 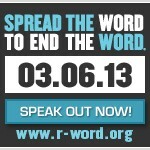 To sign the pledge, go to www.r-word.org. For resources on how to honor the Day of Awareness at your local school, go to http://www.specialolympicswisconsin.org/family_rword.html.